Lex Luthor lends Superman a hand against the Vyndktvx controlled Super-Doomsday but is taken out in short order. The Anti-Superman Army pig piles on Superman with one of their members causing the Man of Steel to hallucinate. The Legion, Lois and Jimmy are still at the hospital with Mxyzptlk when his son bursts in. It turns out his son is actually a damaged edge of Vyndktvx who is carrying the shirt his mother was holding when she died. Mxyzptlk almost dies but Lightning Lad keeps him alive just long enough to tell them how to defeat Vyndktvx. Back at the fight Adam Blake arrives with a team known as the Wanderers and they take on the Anti-Superman Army leaving Superman free to face off against Vyndktvx. The demon from Dimension 5 grabs the Man of Steel who calmly reveals that he has had a lot of time to figure out how to beat him. At Superman's urging every man, woman and child says their names backwards which sends Vyndktvx back to the Fifth Dimension. The only problem is that the shell of Super-Doomsday goes into auto-destruct mode, but Superman is able to fly it into space where it explodes. Vyndktvx is arrested once he returns to the Fifth Dimension and Mxyzptlk and Princess Gzy marry and have children. The story of this is told to baby Kal-El by his mother Lara shortly before her husband comes in to tell her that Krypton is doomed. Mrs. Nyxly uses her last wish to help Superman save the team on Mars. Superman crashes back to Earth and is soon talking to Lois Lane on a cell phone as Clark Kent. Clark asks Lois what he missed as he was chasing a story and got into a brawl. He tells her he's fine but she should see the other guy. Story - 2: Over the past few issues I have gone out of my way to point out that the problems I had with the stories were my own and that Grant Morrison was telling the stories he wanted to so it's not his fault that I wasn't liking it because he was just doing what he was hired to do. I'm not going to do that with this review. This time all of the fault is going to Grant for not sticking the move on the landing. The non-linear approach to telling the story was fine for the past several issues because we had a villain that was attacking Superman simultaneously from different points in time so add that to the fact that it was a fifth dimensional villain and there is room for wackiness in how the story is presented. The thing is if you are going to do that and take the audience on this ride and make them do a little extra work then I think you owe it to that audience to give them an ending that not only resolves all of that weirdness and is epic enough to warrant the weirdness that you have been putting them through. Sadly Morrison failed on both of these counts. Sure there were some epic moments here and there. 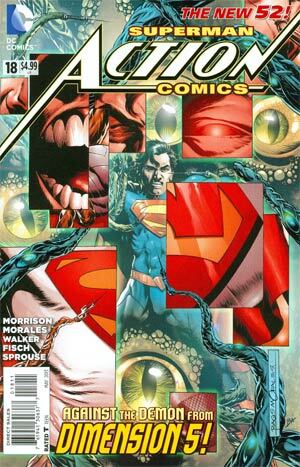 I liked the trippy nature of Superman's hallucinations and how Morrison introduced the Wanderers. 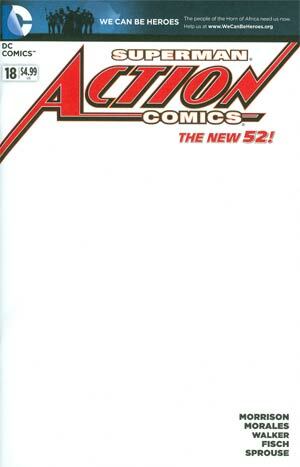 The problem is the rest of this issue was a complete and utter mess. While I can't say that it made no sense because once I looked through it several times I had a pretty good grasp on what actually happened I can say that hitting us with all of this right at the end was a bit overwhelming. 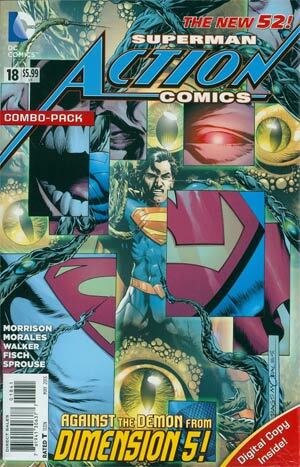 Once again Morrison wasted Lex Luthor as a character by having him get taken out in the first few pages. The whole thing with Mxy and Nxly's son bursting into the hospital room threw me off because it forced me to stop and try to remember if there had ever been a mention of this guy before. 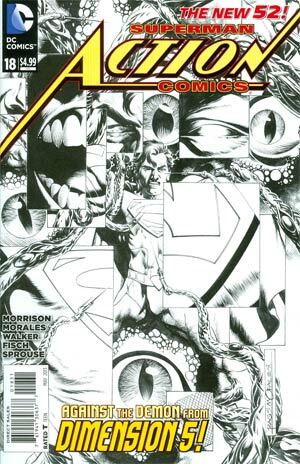 Then Morrison made it seem that Superman and Mxyzptlk had faced each other before but I always got the sense that Mxy was posing as an entertainer and didn't have all that much to do with Superman. 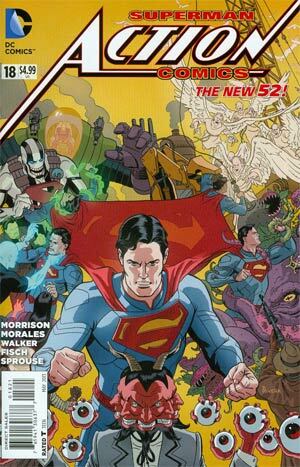 Then Morrison brings in the Wanderers, which are a neat idea and do go back to the issues where we first met Adam Black and Susie but to be honest I had kind of forgotten about that sub-plot and I was a little annoyed that it was brought back because the only purpose they served were to beat the villains I wanted to see Superman defeat. Then there's the ending. So all of this leads up to everyone on Earth saying their names backwards and that defeats the bad guy? This is the ending to Morrison's JLA run all over again where the bad guy was defeated by everyone on Earth getting super powers. Is it a neat idea? Sure. Is it something I wanted to see in this story? No, because it takes the victory that should belong to the hero of the piece away from that hero. Superman couldn't beat this threat on his own so he needed the Wanderers and humanity to bail him out. To be fair I liked the idea that Vyndktvx was only fighting Superman once whereas Superman had learned from his past encounters and thus figured out how to beat him but the execution of that left me cold. Add to all of that the fact that the finale was rather boring and this issue ended up being a huge disappointment for me. I appreciate that Morrison was trying to tie all of the different elements of his run together and we got some cute little moments along the way but in the end it was just a poorly executed ending to a story that I did enjoy if not like at times. Both the bedtime story thing that Morrison threw in at the end and everyone not knowing if Superman survived or not left me cold because there was no real payoff for it. It seemed to me like Morrison didn't know what to do with the last few pages so he fell back on a "cute" ending with Clark telling Lois, "Well, you should have seen the other guy." At some point in the future I am going to sit down and read this entire run all in one shot and hopefully when that happens I will change my mind about this ending. For the moment I am just left with a lot of disappointment. All of the epic beats fell flat, the weirdness was really off putting, I didn't care for any of the characters and I am still wondering what purpose the Legion of Super-Heroes served especially since Superman figured out everything on his own. This issue was a disappointing end to a story that had a lot of potential. Art - 3: The art was up and down throughout this issue. There were some pages that I really liked and others that, like the story itself, left me kind of cold. I hated the design of Lex's armor, the two page splash of Superman punching Super-Doomsday looked awkward and the scene where Superman lifts the now empty shell of Super-Doomsday just didn't pop like it should have. Brad Walker did some nice work with his pages and it's not his fault that I just didn't care about the portion of the story he was drawing. I will say the trippy pages were neat and I liked the shot of the New 52 version of Superman Red/Superman Blue but overall the art, like the story, was mostly disappointing with a few bright spots along the way. In the year 2238 a small, alien boy witnesses an act of bullying of another alien near the Superman exhibit at the Noah D. Random Museum of Our Terran Heritage. The boy is so inspired by the various images and videos of the Man of Steel that he stands up to the bully, who backs down. The bully and his friends leave and the aliens celebrate. As they walk away the boy looks back at the Superman statue, which actually seems to wink at him. Story - 4: This was a simple story that I was initially disappointed with until I re-read it to write this review. On the surface it serves two functions; to show what an inspiration Superman is even if he's not actually in the story and serve as a celebration of Superman himself. If I had to take a guess Sholly Fisch was more concerned with the first function than the second. In fact the second function is probably all in my perception of the book and had nothing to do with what Fisch had in mind. It's a cute story and I liked all of the little Easter Eggs Fisch threw in from the "It tickles" bit (which calls back to not only a classic Golden Age cover but another classic cover from 1993) to the "You've got me? Who's got you?!" reference. The reason I changed my mind about this story is that it does show what an inspiration Superman can be without beating us over the head with it. By showing that Superman's actions can inspire a young boy to stand up to a bully Fisch is showing what a powerful idea Superman is and I can't be disappointed in that. Plus the story is quite good on its own. In fact the only "problem" I had was where that freaking adult leading the group was while some of her charges were being bullied? This isn't the mean streets of Metropolis. This seems to be some kind of class field trip so while it is all well and good that the boy learned to stand up to oppression and all that he shouldn't have had to in the first place. Yeah, that may sound silly but it was an honest reaction to the last page. Your mileage may vary. Art - 4: Chris Sprouse and Karl Story did an amazing job on this story. With the near absence of dialogue, the storytelling was placed squarely on their shoulders and they didn't drop the ball. All of the little Easter Eggs they drew were just icing on the cake. I especially liked the Christopher Reeve style flying shot behind the statue on the splash page in addition to the other Reeve inspired shot on the next page which also had a nice little homage to Superman Returns. Those were fun and showed that it still looks like Superman even with the new costume. I was especially impressed with the two panels that carried page 6 to page 7. The bully has his fist pulled back and is ready to strike but something changes his mind and you see that in him loosening that fist. It is subtle and actually took me a second look to actually see it but it made for a very strong lead in to the aliens standing up to him. Oh, and I really liked the wink at the end of the story. It was a nice touch. Cover Art - 4: This is yet another example of a cover that is good on a technical level but I still don't care for it. I appreciate that it is composed of many smaller images coming together to form one image which reflects the story having so many elements that come together right here at the end but it just doesn't do a whole lot for me. So it gets a high mark even though I am not a fan. Because that's how I think. Variant Cover Art - 4: This is a very solid variant. Paulo Rivera has produced a nice jam cover and aside from the yellow background I like the image quite a bit. Variant Cover Art - 4 (Black and White): And this is why I wrote that this cover is fantastic on a technical level. The penciled version not only shows off Rags' talent but also shows off how intricate the image itself is. The layering is so impressive. Variant Cover Art - 4 (Blank): My first reaction to the sketch cover (which I actually managed to get my hands on) was to write, "This is the worst cover of the bunch. It's so lazy! There isn't even an S symbol on it! What am I supposed to do with this?" but I decided against that. Sure it would have been funny but not really funny. So... there's a sketch cover for this issue as well. And it's blank. So you can have an artist sketch on it at a convention. That is all.